@Adit wrote: How about the tactics though? When only one player had a good game out of eleven then the tactics are wrong. It took Zidane so long to sub. Modric, Kovacic, Isco, Varane, Marcelo and Lucas all had great games imo. If you remember, we dominated the first half, Barca came back in the second and got a goal that should have been disallowed. We had the chances that could have put this game away early, it's not ZZ's fault we didn't finish our dinner. RM fans. 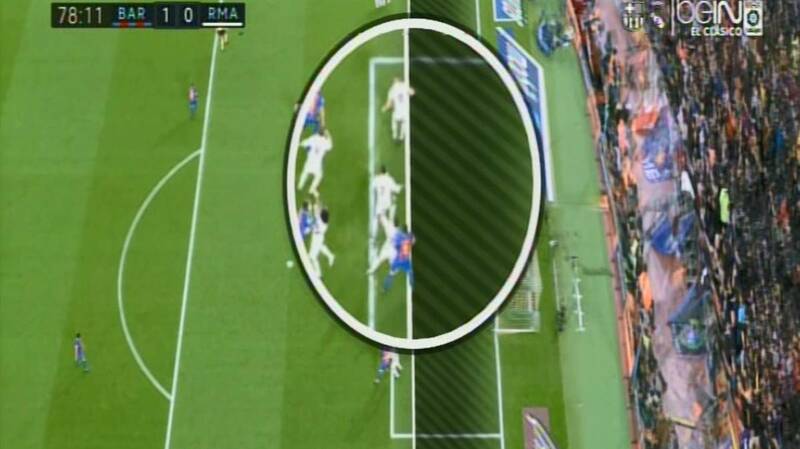 I can understand a bit, because we did dominate the first half and could have/ should have put the match away in 45 minutes, however Barca played much better in the second - The result in the end I think is fair even though Suarez was offside. Happy with the draw, Ramos saved our asses again. We really need to offload Benzema, such a awful player. tbh i donno why is turning a blind eye to vasquez, i mean he does nothing attackingly, even his defending is not that of a RM, its of a RWB. He is never close enough to fullback to pressure him, always causing confusions with carvajal, and carvajal is doing the same attacking stuff as vasquez. Last couple of game he has been poor, he is good as a sub but not a starter in madrid. lets try assensio there. No more so than with Morata. Both are subs but play with energy something that Benz seems incapable of. I did say first choice is Ronaldo and to be realistic that is what the lineup against better teams should be, let Mariano or Morata when he's available come on later in game. For now unless it's a smaller team or perhaps the world club championship is where Benz should play. But clearly the onus has to be on Benz to earn that starting position. 1. We didn't need an extra midfielder. We bossed the midfield. I didn't know Rakitic or Gomes were even on the pitch. Busquets did play very well though- best Barca player imo today. 2. No team can press Barca the way we did for the full 90 minutes. We would have been absolutely shredded by minute 65 if we kept pressing them. It's smart to be more conservative at times and hold well defensively to give your midfield a rest. 3. Isco being subbed was a question mark for me. Thankfully Casemiro was on the pitch though or we would have lost the match in the final minute. 4. Mariano didn't really provide anything for me, imo. His sub whether early, on time, or late wouldn't/ didn't influence the scoreline. Kovacic influenced the game more. ZZ set us up to win today, and we had the better of the chances. A draw at Camp Nou is not a bad result when you are top of the table and Barca trail by 6. One thing that hasn't been mentioned is how our left side held up. The side that Messi is supposedly playing. For all the criticism(defense) that is normally directed at both Marcelo and Ronaldo, the left side was well defended today. 4- You are kidding right? I know right? It's the Camp Nou ffs not to mention that we are plagued with injuries. I remember a few years back when going home with a point in the Camp Nou seems like a victory to everyone else. Looking at the comments here it feels like we got a trashing! Are you guys aware that even when we have been on hot streaks, barcelona still thrash us. We had a draw at Camp Nou for Christ sake, that is something to be proud of. This is barca, and all our plans usually go out the window against them but not this time around. But i get the pain. Benzema was awful, but who could have predicted. He produces his best performances against Barcelona and in UCL. The problem I have with ZZ is not with starting Benzema, but not subbing him off since the 60th minute. I am not a big Ronaldo fan but Ronaldo was starved of service and he still managed to produce some magic. Casemiro for Isco was a good sub; isco could not mark effectively because he was on a yellow card. We had to sacrifice some offensive strength for defensive stability. The result was good enough, you guys should stop crying. Let's just hope Benzema gets benched because unlike Ronaldo or Bale, i do not see Benzema ever bouncing back again, he looks permanently lost. I may get a lot of stones pelted my way, but i prefer Kovacic to kroos. He is more mobile, releases the ball quicker, spreads the play maybe a tad not as effective as kroos, provides better defensive balance and gives us those piercing runs through the middle that we have been missing since Di maria. To be honest, the only injury that has affected us is Bale. He is so instrumental our flexibility in terms of formation. A Ronaldo injury will affect us too. We have coped without varane, pepe, ramos, modric, casemiro, kroos, isco, benzema. @Shade, I understand your view but I felt they were there for the taking but we couldn't capitalise. The yellow to Isco as a reason for subbing him off is nonsense. Carvajal had a yellow and was up against the biggest crybaby diver the game has ever seen and he was fine. I could understand if we sacrified him because we needed Kovacic' speed in transition but never because of the yellow. Not really surprised with this article. In fact, I think it was long overdue. No physicality, he lost ten balls, and when he had a very clear chance, Jordi Alba had time to react and take the ball. On Saturday afternoon, he was subbed after 77 minutes and Real were more of a threat up front once Marco Asensio went wide and Cristiano Ronaldo played centrally. Even Mariano Diaz looked more menacing in the five minutes he played. I can't see how that is true. How can a forward have 10 turnovers? A non dribbling, not that quick forward mind you. 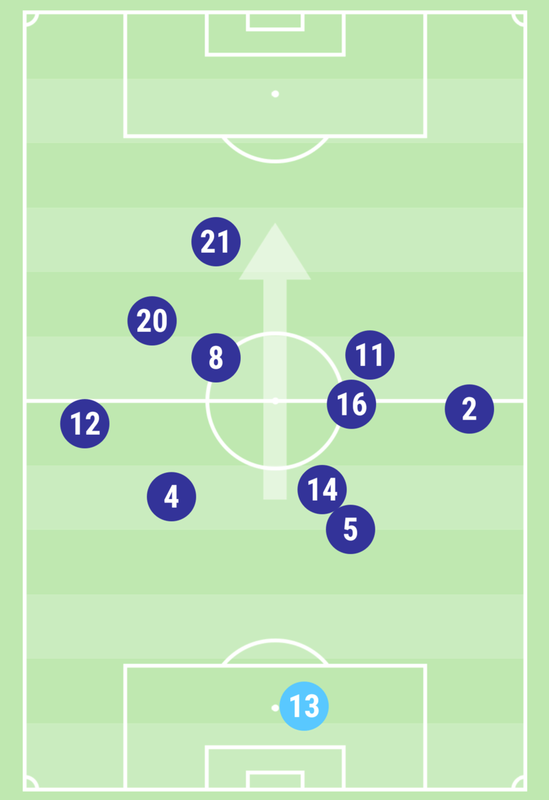 So I saw the average positions of our players, out of disgust I thought I'd measure them against our 2 reference performances this season. 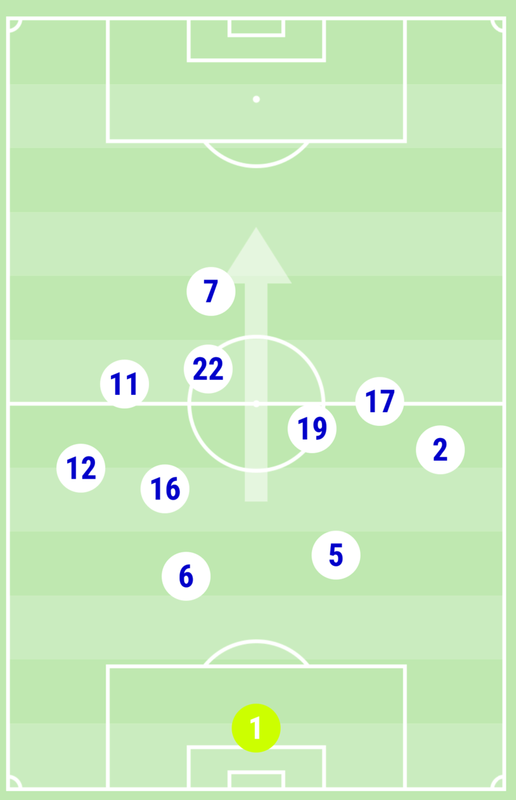 Average positions iin our best game this season (vs LaReal at the Anoeta), as you can see we have lined up in a nice 4141 shape, with Casemiro protecting the defence and the mids covering the whole width of the pitch. Result: A magical performance with LaReal not having a single sniff at our goal. Telling how vital a left winger or something who can pull wide left is for Zidane's tactics. Asensio and Bale respectfully played that role nicely. 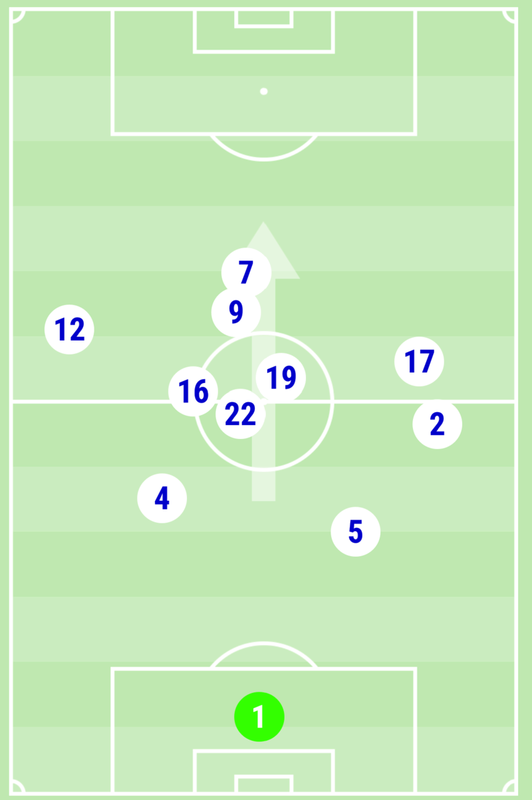 Benzema being a CF can't/won't pull wide to give any width so Marcelo had to be our left winger which left a gaping chasm of space which Barcelona did not utilise at all. Isco was always gonna drift in the centre and try to go out wide but off the ball, he was in the centre most of the time. You do realize the evidence you presented looks almost identical to the so called "best" performances with marcelo playing a bit further up. That's really beside the point anyway- our players are going to be in different positions given different opposition. Barca don't play the same way as La Real, or Atletico so player heat maps are going to look different given the situation. Let's sum this up because arguments are starting to become circular. We got a point away at Camp Nou against Barca who are in second place. We are 6 points clear at the top. Barcelona, though they had their weaknesses, we had injuries to two of our most impactful players this season (imo), plus Morata who would have no doubt been subbed in or maybe started, not to mention Casemiro wasn't fully fit. Those are the facts. When I look at the facts I don't get angry and post negative things on an internet forum. In my opinion RM played well given the conditions. We could have won, sure, if that penalty was called in the early minutes of the game things would have been different. Overall we dominated the majority of the first half, and Barca came back in the second and exposed some of the fatigue of the RM players. I think a draw was a fair result (one that highly favors us).